(Hershey, PA) - The Hershey Bears are the new world record holder in one of the best promotions in all of sports. 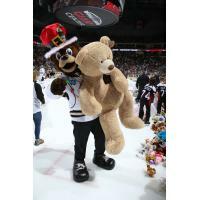 The Bears, the oldest and most decorated team in the American Hockey League, collected 34,798 teddy bears and stuffed animals in Sunday's annual CommunityAid and WGAL Teddy Bear Toss. This surpasses the team's record of 25,017 collected in 2017, and the world record of 28,815, previously set by the Western Hockey League's Calgary Hitmen in 2015. The world-famous event sees fans throw stuffed animals onto the ice following the team's first goal of the game. The stuffed animals are then collected and donated to charity ahead of the holiday season. The teddy bears and stuffed animals are collected and donated to over 30 local organizations including schools, food banks, churches, lions clubs, as well as the Milton Hershey School, Children's Miracle Network, and the American Cancer Society. For more information, media members are asked to contact Zack Fisch, Manager of Hershey Bears Media Relations and Broadcasting, at zasfisch@hersheypa.com, or Matt Trust, Hershey Bears Media Coordinator, at mctrust@hersheypa.com.